I know you’re going to call me the “Sea Salt Caramel Queen,” with all the sea salt caramel recipes I currently have on my blog. But I just can’t resist them. 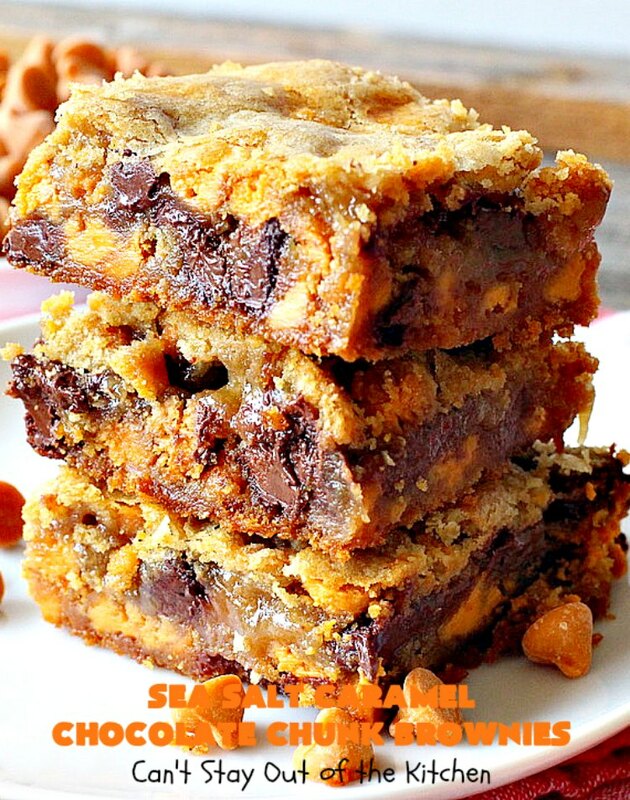 I have one with Double Chocolate, one in brownies with caramel icing, and one with peanut butter chips. I also have one with just salted caramel chips, one with chocolate chips and one with white chocolate chips. 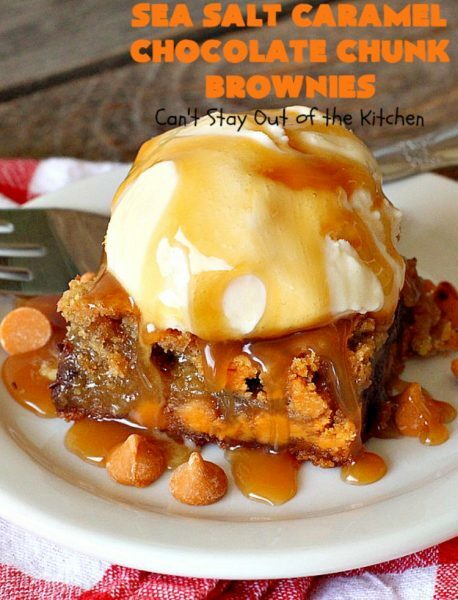 I even have one with peanut butter brownies, oh yum. Yes, I love baking with sea salt caramel chips, they’re just so heavenly. I got a call from a friend in February. She was wondering if I could make a dessert for the youth luncheon on Saturday during our Disciple Now Weekend. 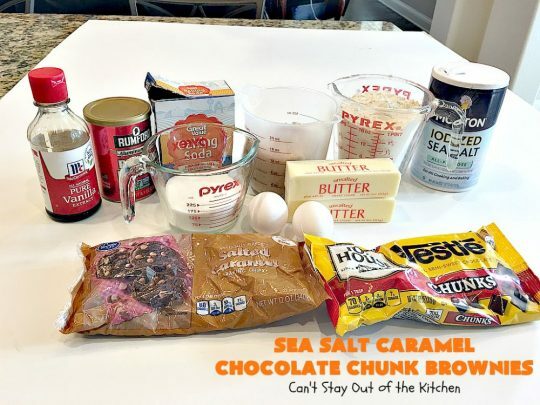 So I looked through my pantry and saw several ingredients I really wanted to get rid of. The salted caramel chips and chocolate chunks had been collecting dust since Christmas cookie baking, so I really wanted to use them up. I decided to combine them in this fantastic recipe. Ding, ding, ding, ding, D-I-N-G! Yes, they really are that good. 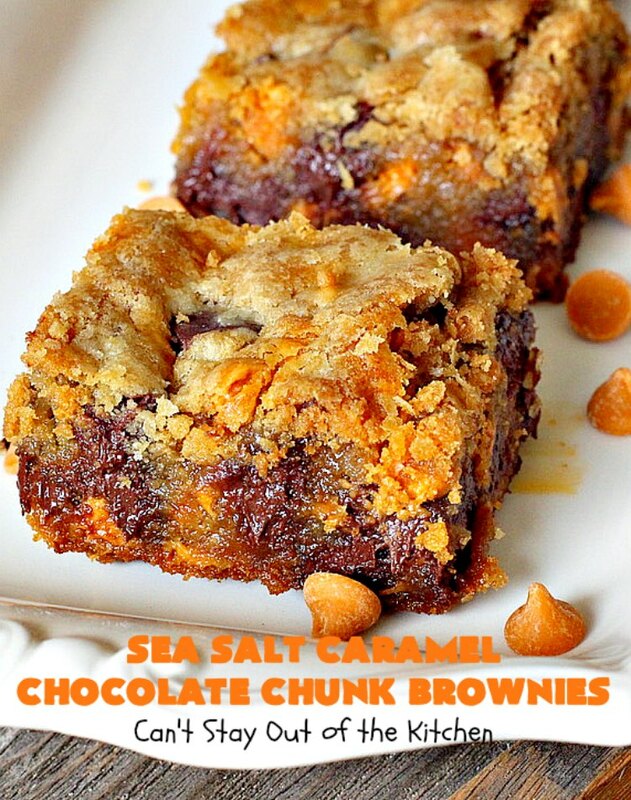 Sea Salt Caramel Chocolate Chunk Brownies are rich, decadent and divine! 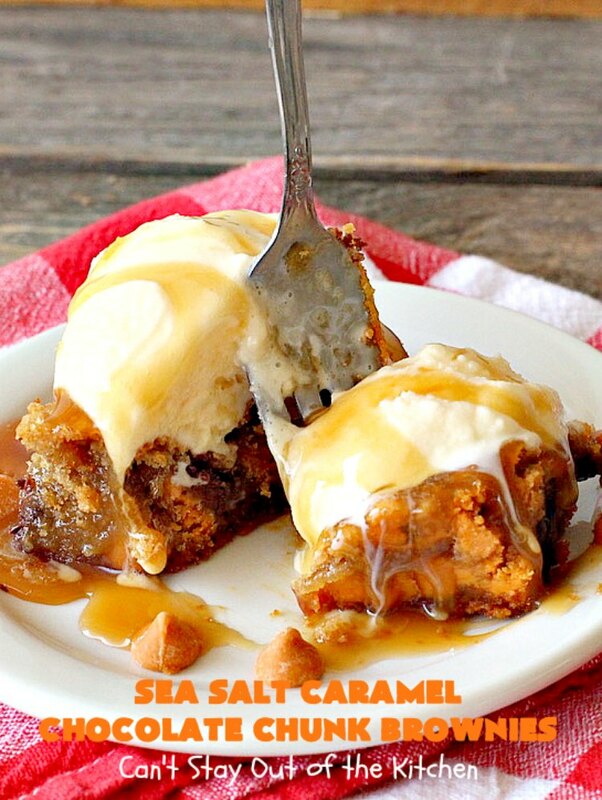 This makes a perfect dessert for summer holiday fun. Caramels and chocolate are heavenly. Soften butter. Place in a large mixing bowl with granulated sugar, brown sugar, eggs, vanilla, baking soda, baking powder and sea salt. Add UNBLEACHED all-purpose flour. (Bleached flour toughens baked goods). 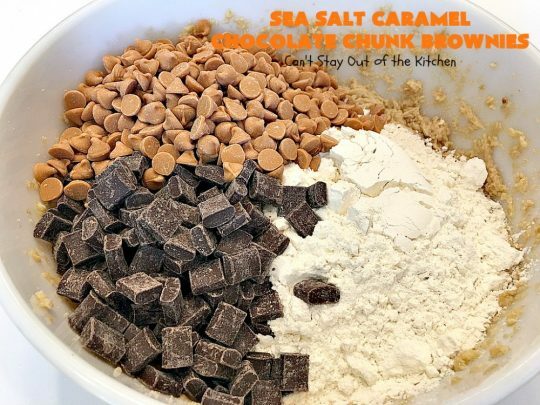 Add chocolate chunks and sea salt caramel chips. 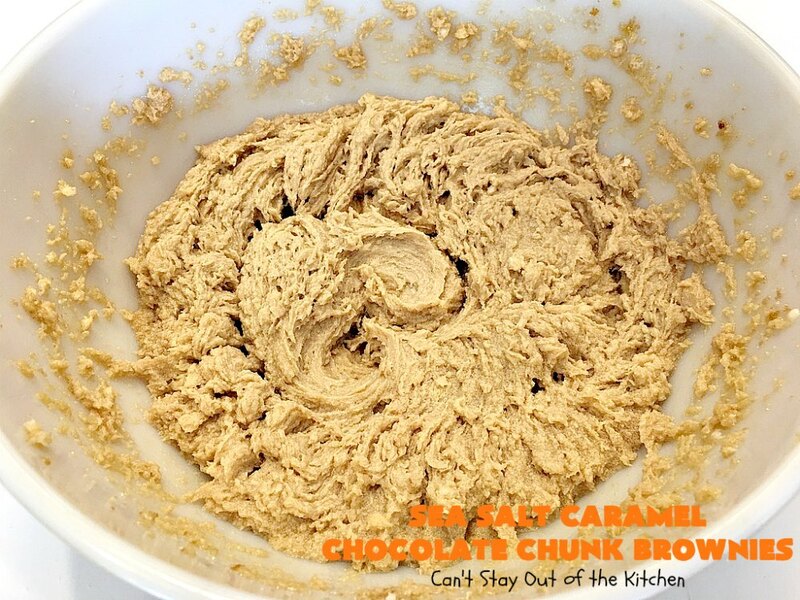 Stir ingredients together with a wooden spoon to combine. 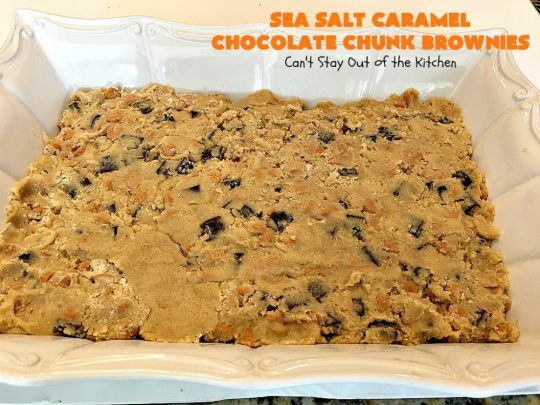 Press mixture into a greased 9×13″ glass baking dish. Smooth top. Bake at 350 for about 45-50 minutes or until a toothpick inserted in center comes out clean. Cool completely before cutting into bars. 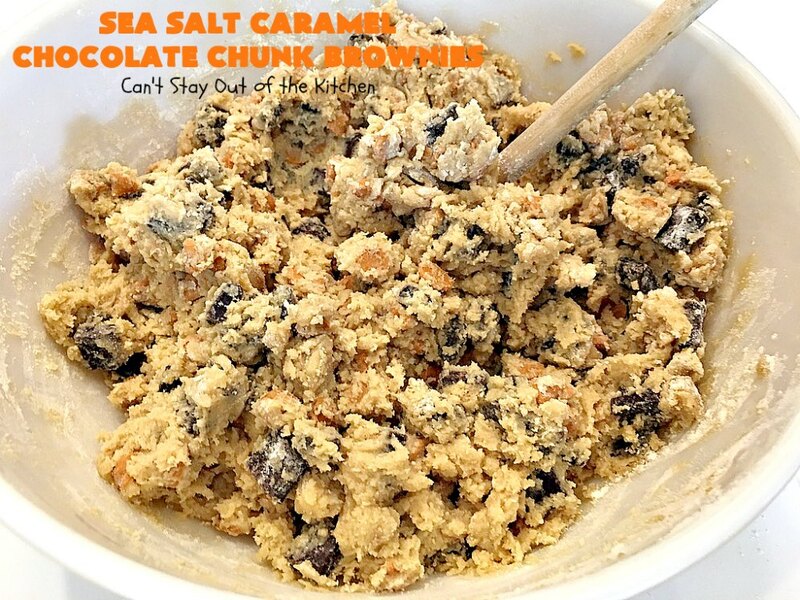 These make great treats for tailgating parties. 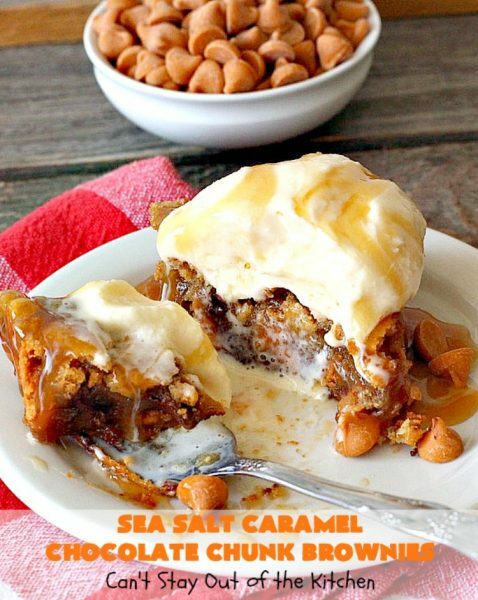 Yes, a dollop of ice cream and caramel sauce makes this dessert even dreamier. 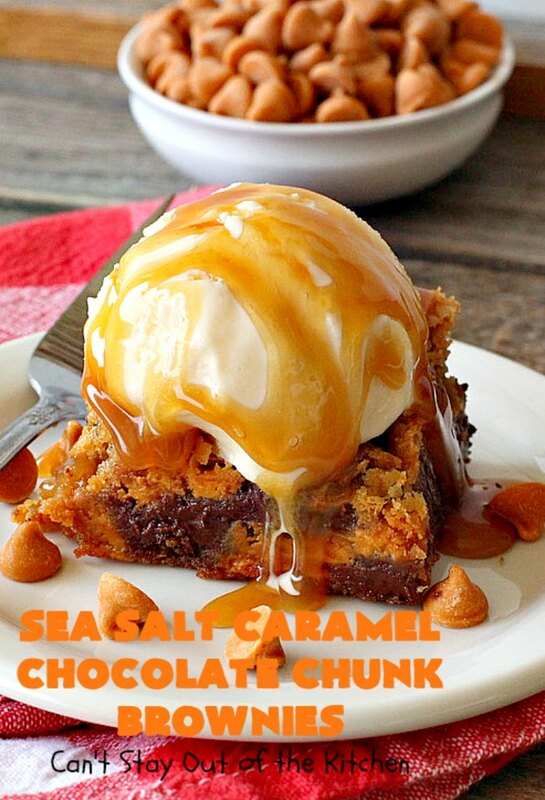 Sea Salt Caramel Chocolate Chunk Brownies are ooey, gooey and delicious! Your family and guests will rave over these fantastic brownies. 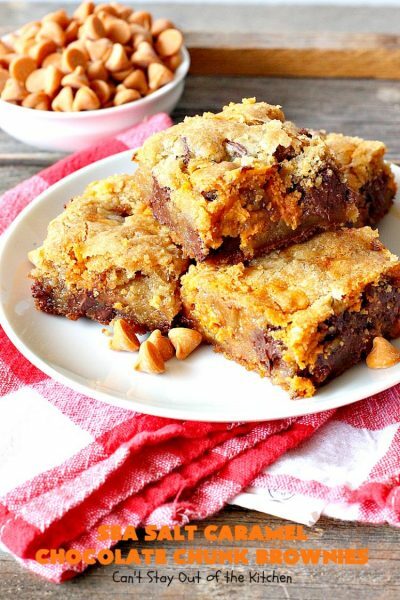 These brownies are unbelievably rich, decadent and heavenly. 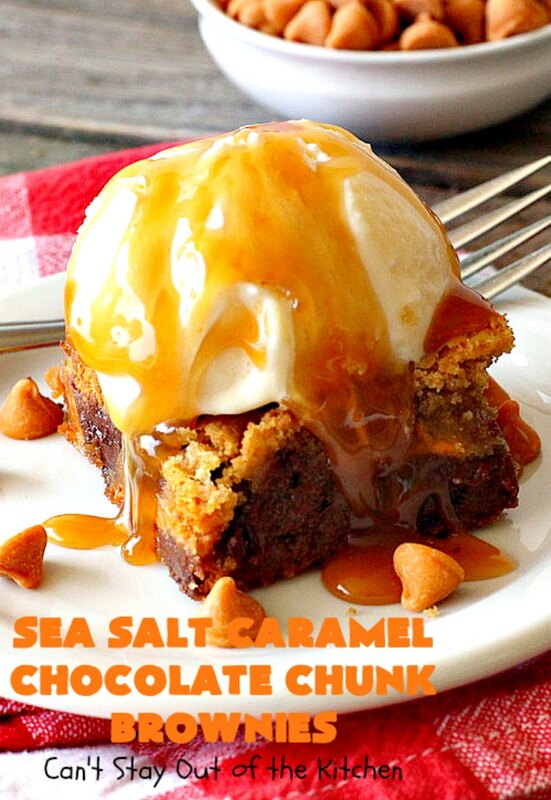 Chocolate and caramel is a marriage made in heaven! 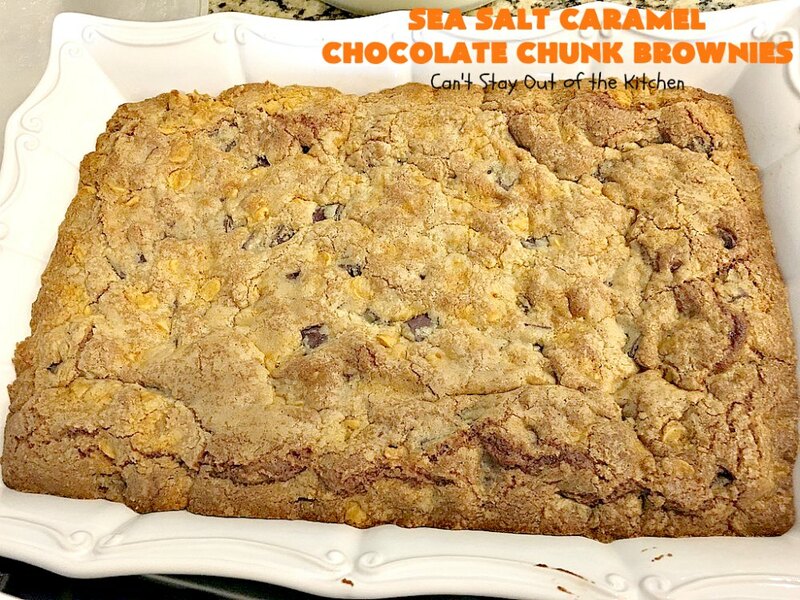 They're perfect for tailgating or office parties, potlucks, or summer holiday fun. Stir in flour, caramel chips and chocolate chunks with a wooden spoon to combine. Spread into a greased 9x13” glass baking dish. 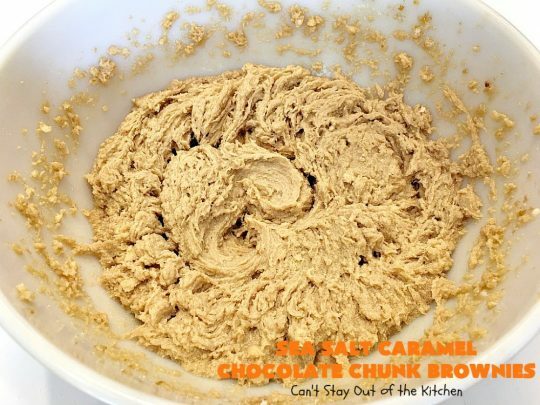 Bake for 30-40 minutes or until a toothpick inserted in center comes out clean. NOTE: My brownies took about 45-50 minutes to bake completely. 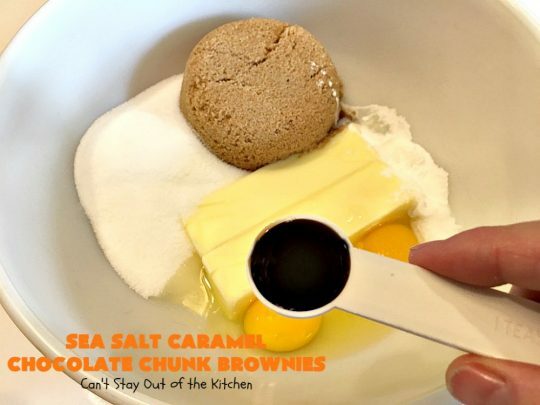 Every bite of Sea Salt Caramel Chocolate Chunk Brownies will have you drooling. 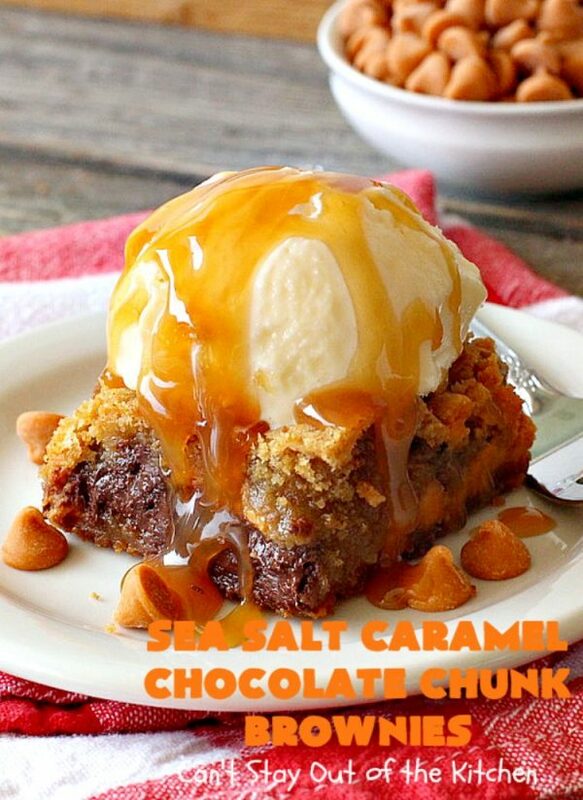 This is a marvelous dessert for Mother’s Day or Father’s Day….especially if you love caramel and chocolate. 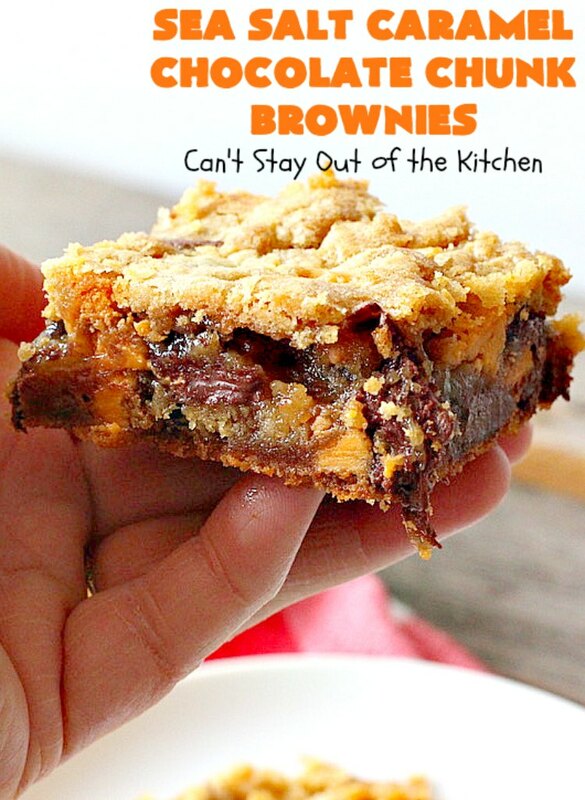 These brownies are so heavenly, you won’t want to stop eating them. 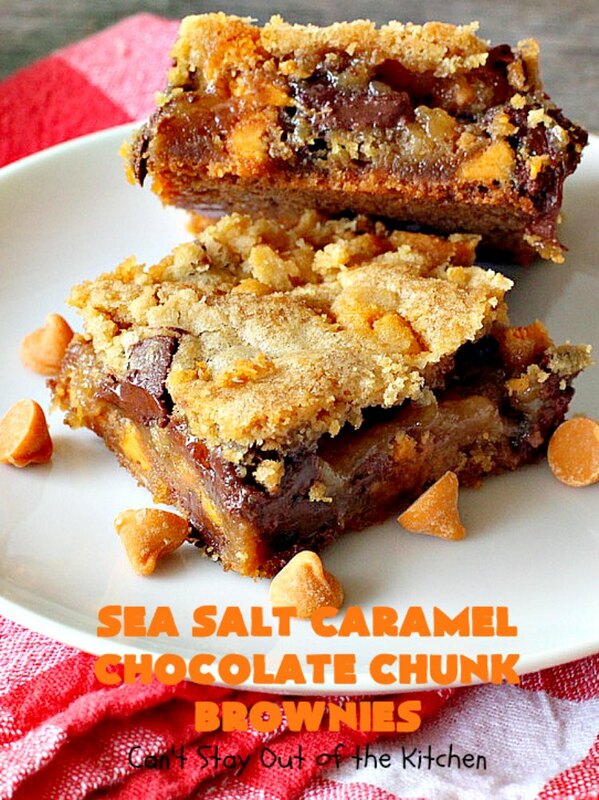 Enjoy a stack of Sea Salt Caramel Chocolate Chunk Brownies today! Wow! These are everything you’d ever dream of in a brownie! Love!!!! Yes they do! Thanks, Kim.